This piece was created for an auction/donation to the Cultural Center of Cape Cod. If you are not familiar with the Cultural Center I recommend checking them out. They offer a variety of events and services that create a brighter and more diverse Cape Cod community. Scroll down to learn more about “Sacred Owl”. Inspired by a variety of indigenous culture’s animal spirit belief systems, I have created my own piece of writing to accompany Sacred Owl. A sacred space is the light in wich we fly. Above the world lives clear sight and infinite time. For these are our moments and none are to spare. Sacred Owl’s home is constructed using my “wood & wire” assemblage technique. All materials were locally found upon forest floors and seascapes. The owl was originally donated for this charitable cause in ceramic form from the Zooquarium of Yarmouth, MA. Eleven artists then transformed the owl into whatever composition and medium they chose. 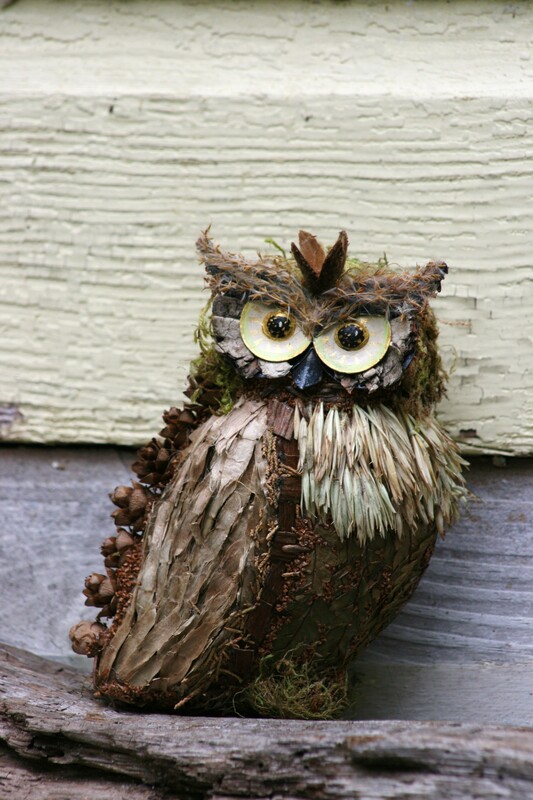 My piece, Sacred Owl, is covered in a variety of plant seeds and moss. Again all seeds are locally found, some more inconspicuous than others. I find the use of plant seeds extremely interesting for they have many conceptual and textural properties. Conceptually the seed holds within it the pending birth of life, new beginnings, and potential bounty. The seed is quite the “sacred” specimen in these ways. With the life of seeds we can grow our own, for it is theirs that gives us ours. In full gestation the seed produces its bountiful fruits and we are granted a privilege to eat and to provide our body with “life nutrients”. Sacred Owl is covered in these “sacred seeds”. The Owl itself is quite the creature. Active mostly at night, it often goes unseen. Even the keenest ears can not detect its silent flight. The Owl’s eyesight and hearing is extremely proficient. It often sees and hears what others cannot. This ultimately is true wisdom and where the phrase “Wise Old Owl” comes from. The Owl is truly an observer of all things that often go unnoticed. The Owl is “Sacred” for like a God(s), it watches over all things without others sensing its presence. My piece, “Sacred Owl” pays homage to this magnificent bird.